NEW variety. Glossy evergreen dense habit. New foliage emerges dark red. 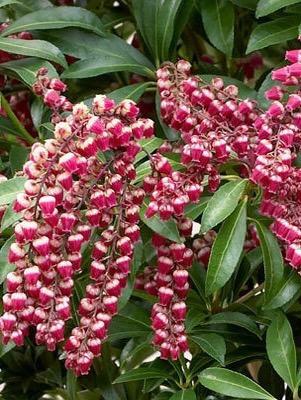 Large clusters of cherry pink lily of the valley like flowers loved by bees, March to May. Sun or semi shade. Acid soil. 2m tall. Good in containers.